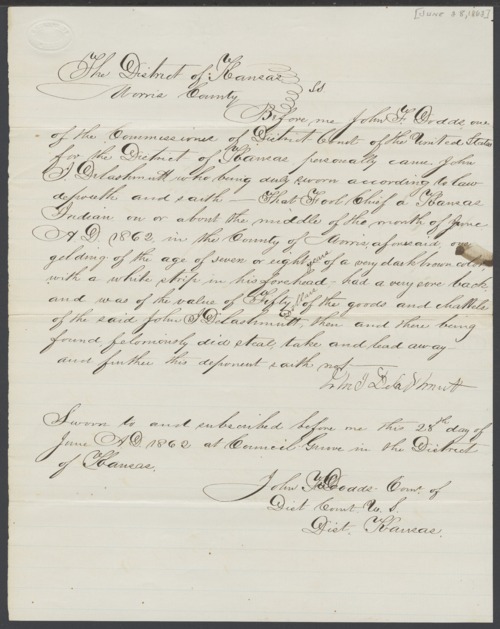 These court documents concern a complaint lodged against Fool Chief, a Kansas Indian, for stealing a horse. Supposedly about the middle of June 1862 in Morris County, Kansas, one horse with a value of $50.00 was taken by Fool Chief. The complaint was made by John Delashmutt. A warrant against Fool Chief and subpoenas for witnesses were issued. The case was dismissed after the witnesses failed to prove that the horse was stolen. The court involved was the District Court of the United States, District of Kansas, and John F. Dodds was one of the court commissioners.